Many runways or landing areas are such that landings must be made while the wind is blowing across rather than parallel to the landing direction. All pilots must be prepared to cope with these situations when they arise. The same basic principles and factors involved in a normal approach and landing apply to a crosswind approach and landing; therefore, only the additional procedures required for correcting for wind drift are discussed here. The crab method is executed by establishing a heading (crab) toward the wind with the wings level so that the airplane’s ground track remains aligned with the centerline of the runway. [Figure 8-15] This crab angle is maintained until just prior to touchdown, when the longitudinal axis of the airplane must be aligned with the runway to avoid sideward contact of the wheels with the runway. If a long final approach is being flown, one option is to use the crab method until just before the round out is started and then smoothly change to the wing-low method for the remainder of the landing. 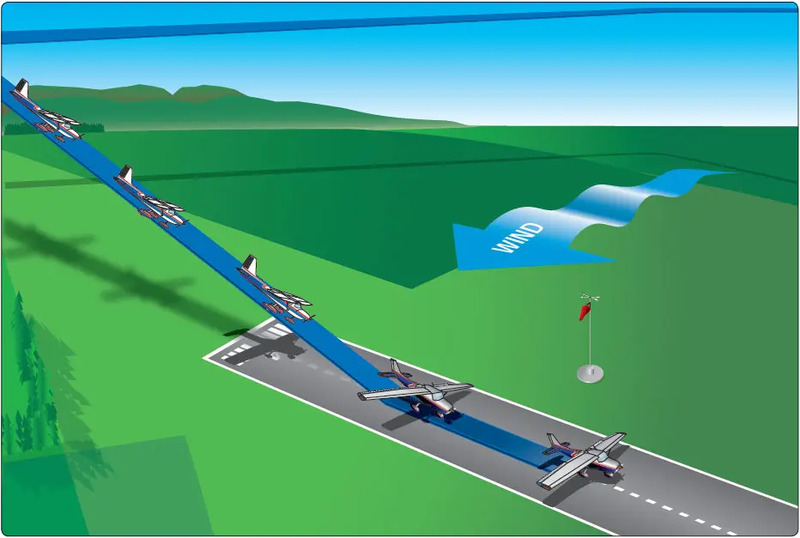 The wing-low (sideslip) method compensates for a crosswind from any angle, but more important, it keeps the airplane’s ground track and longitudinal axis aligned with the runway centerline throughout the final approach, round out, touchdown, and after-landing roll. This prevents the airplane from touching down in a sideward motion and imposing damaging side loads on the landing gear. To correct for strong crosswind, the slip into the wind is increased by lowering the upwind wing a considerable amount. As a consequence, this results in a greater tendency of the airplane to turn. Since turning is not desired, considerable opposite rudder must be applied to keep the airplane’s longitudinal axis aligned with the runway. In some airplanes, there may not be sufficient rudder travel available to compensate for the strong turning tendency caused by the steep bank. 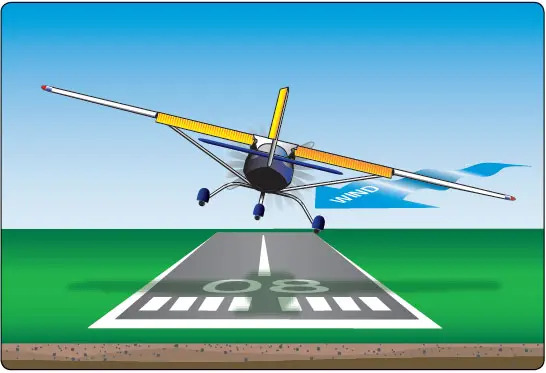 If the required bank is such that full opposite rudder does not prevent a turn, the wind is too strong to safely land the airplane on that particular runway with those wind conditions. Since the airplane’s capability is exceeded, it is imperative that the landing be made on a more favorable runway either at that airport or at an alternate airport. Flaps are used during most approaches since they tend to have a stabilizing effect on the airplane. The degree to which flaps are extended vary with the airplane’s handling characteristics, as well as the wind velocity. Generally, the round out is made like a normal landing approach, but the application of a crosswind correction is continued as necessary to prevent drifting. Since the airspeed decreases as the round out progresses, the flight controls gradually become less effective. As a result, the crosswind correction being held becomes inadequate. When using the wing-low method, it is necessary to gradually increase the deflection of the rudder and ailerons to maintain the proper amount of drift correction. Do not level the wings and keep the upwind wing down throughout the round out. 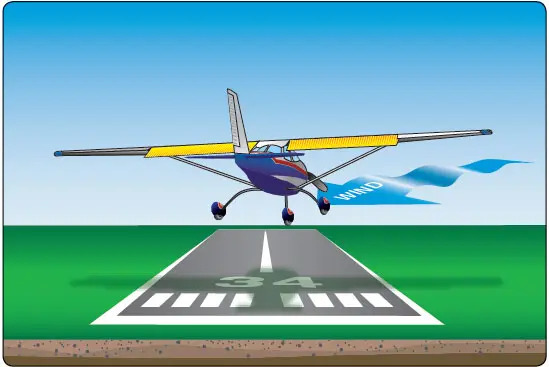 If the wings are leveled, the airplane begins drifting and the touchdown occurs while drifting. Remember, the primary objective is to land the airplane without subjecting it to any side loads that result from touching down while drifting. If the crab method of drift correction is used throughout the final approach and round out, the crab must be removed the instant before touchdown by applying rudder to align the airplane’s longitudinal axis with its direction of movement. This requires timely and accurate action. Failure to accomplish this results in severe side loads being imposed on the landing gear. If the wing-low method is used, the crosswind correction (aileron into the wind and opposite rudder) is maintained throughout the round out, and the touchdown made on the upwind main wheel. During gusty or high wind conditions, prompt adjustments must be made in the crosswind correction to assure that the airplane does not drift as the airplane touches down. As the forward momentum decreases after initial contact, the weight of the airplane causes the downwind main wheel to gradually settle onto the runway. In those airplanes having nose-wheel steering interconnected with the rudder, the nose wheel is not aligned with the runway as the wheels touch down because opposite rudder is being held in the crosswind correction. To prevent swerving in the direction the nose wheel is offset, the corrective rudder pressure must be promptly relaxed just as the nose wheel touches down.